The pears in the drawing symbolize hope. The mocking bird is not only from Oprah’s favorite book, “To Kill a Mockingbird” but is the official State Bird of Mississippi. In 2001, I drew the above portrait after a gloomy period of questioning my career as an artist. My slow progress made me wonder if what I had envisioned for myself was nothing more than a fantasy. My discouragement dissipated after turning on the Oprah Winfrey Show. I was reminded that any obstacle I faced was minuscule in comparison to what she had been born into. She is black, female and perhaps the worst sin of all, ample in size. Yet none of this has stood in her way of becoming one of the most influential women in the world. Yes, Oprah’s life clearly shows anything is possible. There is much to hope for. Born in rural Mississippi to an unwed mother, Oprah was left to be raised by her grandmother, Hattie Mae. 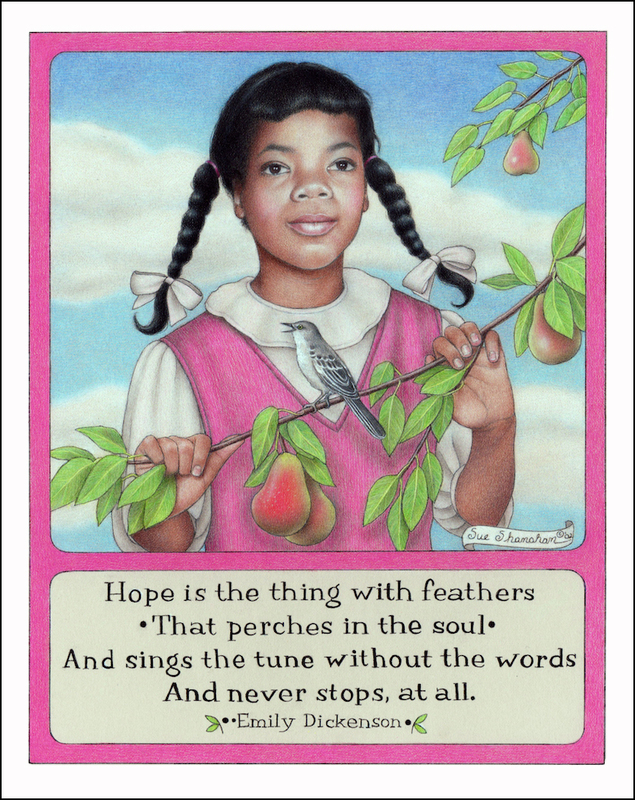 Oprah remembers at age four, standing on the back porch churning butter. Her grandmother, called to her as she hung cloths on the line, “Oprah Gail, you better watch me now, ’cause one day you gon’ have to know how to do this for yourself.” But hope had already made a nest in Oprah’s soul. She refused to accept her grandmother’s vision for her future. She knew deep inside her life would be more than hanging clothes on a line. Growing up, I think the same thing that perched in Oprah’s soul breathed in mine too. Looking back I remember cultivating hope as a kid by saving my drawings for biographers who would one day write about my life as an artist. Then, as a teenager, I wrote to Norman Rockwell for advice on how to become an illustrator. The encouragement in his response confirmed that my dreams where indeed possible. Hope is the tiny spark of light barely seen that pulls us forward. Without its flicker, I never would have taken the initiative to save my art or contact my hero. 2014 is going to be a good year. It’s the year for reaping what we’ve so patiently sown. It’s the year when our long-held dreams will be brought to fruition. No matter where we stand, we can see the glimmer of a better day. How do I know all this? Because 2014 is the year of hope. It’s time to fan that flame. A painting for a Mother’s Day card I saved for my biographer when I was eight. Thank you, Lois. May hope and all it brings, follow you through the new year. PS: so you were an artist already at age of 8 ! Great! 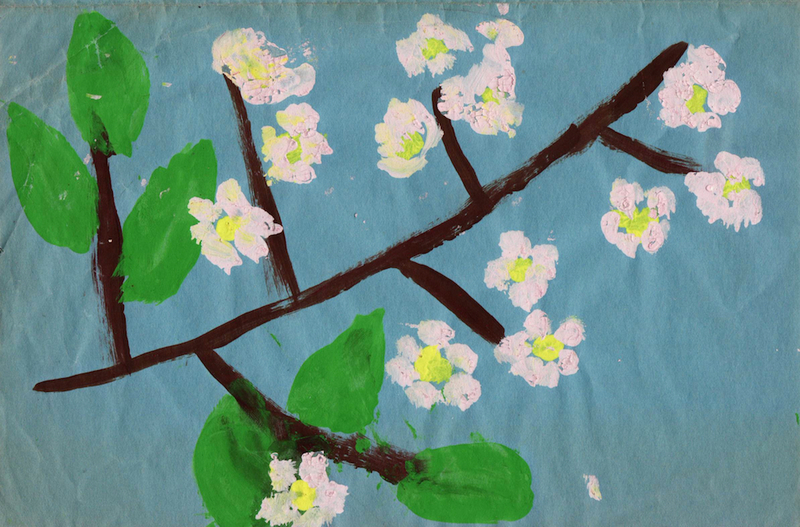 That’s a beautiful post Sue… I LOVE that you shared your art from when you were a child with us. It was beautiful even back then! Thanks for always inspiring me and so many others. Your work and your words are very powerful.